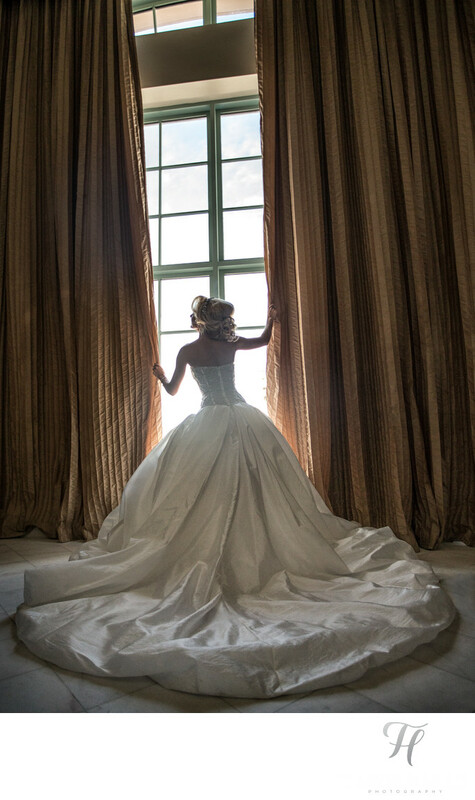 A favorite of mine (and the brides) from her wedding day at the Hotel Colonnade. It was at this point that all of the detail shots were done, and all of the styled shots of Julie (bride) were done. We were literally about to walk out of this room, and I looked back and I noticed that one of the bridesmaids was closing up the main windows, and this prompted an idea for me. I asked Julie "for one more shot" and to walk over to the window. I had her grab the curtains with both hands, (one higher and one lower) and lean forward a bit to make the shot less "static". Meanwhile, I had all of the girls standing around come, and give me a hand with the dress, and spread it all around her perfectly. I wanted to make this a darker, more dramatic looking shot so I went with an under exposed value in the camera, and got this. I was pretty happy with the results, and went right over to Julie and showed her. She was so happy, and this was a smart thing for any photographer to do (showing clients the back of the camera) this really helps build confidence and trust out in the field, and I can't help but think this will always lead to better results.